Australian and Japanese researchers have demonstrated the application of RNAi technology for gene replacement in plants, developing the world's only blue rose. The CSIRO-developed RNAi technology was a key technology used under license by Florigene Ltd, a Melbourne-based biotechnology company and part of the Japanese Suntory group of companies to develop the rose. Breeders have attempted to make true blue roses over many years, but none have successfully bred roses with blue pigment. In its first commercial application in plants, the CSIRO-developed RNAi technology was used to remove the gene encoding the enzyme dihydroflavonol reductase (DFR) in roses. A truly blue rose has been the Holy Grail of rose breeders since 1840, when the horticultural societies of Britain and Belgium offered a prize of 500,000 francs to the first person to produce a blue rose. Molecular geneticists with Florigene and Suntory achieved the prize that had long eluded conventional rose breeders by combining something old, something new, something borrowed, and something blue. Roses are very old garden subjects - a favourite for some 5,000 years. The 'something blue' was the delphinidin gene that Florigene's geneticists cloned from a pansy, to direct pigment synthesis in the rose into the 'blue' pathway. The 'something borrowed' was an iris gene for an enzyme, DFR, required to complete the delphinidin-synthesis reaction. 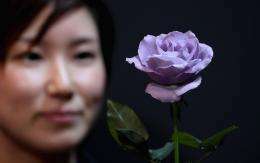 And the 'something new' was a man-made gene, designed by Suntory geneticists, that exploited a powerful new CSIRO-developed technology to switch off a rose gene that had frustrated Florigene's efforts to activate the delphinidin pathway in roses for nearly a decade. Suntory's scientists created the 'silencer' gene to exploit a cellular phenomenon called RNA interference (RNAi). RNAi technology is revolutionizing research and development across the biological and medical sciences, and has been hailed as the most important new research tool to emerge in the past 25 years. Dr Peter Waterhouse's research team at CSIRO Plant Industry in Canberra pioneered the use of RNAi as a high-precision tool for exploring and manipulating gene function in plants. A class of plant molecules called anthocyanins gives rise to the rich variety of colours seen in flowers, fruits and other plant tissues. The major floral pigments derive from anthocyanins, with some contributions from yellow carotenoids. The anthocyanin dihydrokaempferol (DHK) is the precursor for all three primary plant pigments: cyanidin, pelargonidin and delphinidin. The cyanidin gene codes for an enzyme that modifies DHK, directing it into the cyanidin pigment pathway, which produces deep red, pink and lilac-mauve hues. The delphinidin gene - not present in roses - codes for a closely related enzyme that modifies DHK to direct pigment synthesis into the delphinidin pathway. Another enzyme, dihydroflavinol reductase (DFR) further modifies the precursor pigments in all three pathways. Up to this point, all precursor pigment molecules are colourless, so any mutation that disrupts the DFR gene results in white flowers. Florigene geneticists selected a white DFR-mutant carnation to develop the company's Moonseries carnations. Like roses, carnations lack the delphinidin gene. Florigene introduced a delphinidin gene from petunia, coupling it with the petunia DFR gene, to replace the mutant carnation DFR gene. Florigene's new lilac- and mauve-hued carnations, with names like 'Moondust' and 'Moonglow', now dominate the North and South American carnation cut-flower markets; the European Union has yet to approve their release. During the 20th century, rose hybridists created an extraordinary range of novel floral hues. They included lilac and grey roses, which were hailed as a step toward truly blue roses. However, they are now known to be unusual variants from the cyanidin pathway. It is now clear that the conventional hybridization could not have produced a blue rose, because roses are genetically incapable of producing delphinidin. Founded in 1986 as Calgene Pacific, Florigene's major commercial goal was to use gene technology to create the world's first truly blue rose. It acquired Dutch rival Florigene in 1994 and adopted its name. Florigene's scientists took a giant step by cloning the delphinidin gene from a petunia in 1991. By the mid-1990s they had perfected techniques for genetically transforming roses and regenerating plants from transformed cell lines in tissue culture. It enabled Florigene to create the first roses with delphinidin. By the mid-1990s, Florigene had high level expression of delphinidin in an old red variety, 'Cardinal'. The combination of cyanidin and delphinidin yielded a very attractive dark burgundy rose. It wasn't blue, but technically it was a major advance. To create a blue rose, Florigene researchers needed a white rose in which the DFR gene was inactivated. But they were unable to identify a DFR-knockout white rose ready-made for cut flower production - breeding one from scratch would have added years to the project. Florigene researchers regularly consulted Dr Waterhouse's team at CSIRO Plant Industry. In 2001 Dr Waterhouse discussed how RNAi technology could be used to switch off one gene in such a way that it could be replaced by a related gene. Florigene saw the advantage of using RNAi to switch off the DFR gene in a red rose, to block the cyanidin pathway, and then install the delphinidin gene - plus a new DFR gene to complete delphinidin synthesis. Suntory's researchers had the same idea - they used RNAi to create a synthetic gene to suppress the DFR gene in a shapely pink rose. They cloned a new version of the delphinidin gene, from pansy, and, on a hunch, teamed it with a DFR gene from iris. The rose and iris genes are quite similar, and share much of their DNA code, but RNAi is so exquisitely precise that they were able to design a RNAi 'hairpin' gene targeting a DNA sequence exclusive to the rose DFR gene, so the 'knockout' had no effect on the imported iris DFR gene. The three-gene package (pansy delphinidin, iris DFR, anti-rose DFR) package worked: Suntory's transgenic rose produced very high levels of delphinidin in its petals, and a small residue of cyanidin. The new rose is an attractive shade of mauve, similar to the current generation of mauve-lilac roses like 'Blue Moon' and 'Vol de Nuit'. But where these cultivars express cyanidin, and are thus incapable of yielding blue flowers, the new rose, with further 'tweaking', has the genetic potential to be truly blue. Blue shades should be achievable if Florigene and Suntory researchers can make the rose's petals less acidic. Rose petals are moderately acidic, with a pH around 4.5, while carnation petals are less so, with a pH of 5.5. Florigene and Suntory researchers have 'fished around' for roses with higher petal pH, but the low-acidity trait appears to be genetically limited in roses. Researchers are now using RNAi gene-knockout technology to identify genes that influence petal acidity, or that modulate petal colour in other ways. By the early 1990s, plant molecular geneticists suspected that plant cells possess a mechanism that somehow detects and destroys the genetic blueprints of invading viruses. Dr Waterhouse's CSIRO team confirmed the existence of such a mechanism in an historic experiment in 1997. For decades, conventional plant breeders have laboured to develop virus-resistant crops, using naturally occurring genes from resistant cultivars or their wild relatives. Waterhouse and his colleagues constructed a synthetic gene, containing a segment of genetic code copied from Potato Virus Y (PVY), a virulent virus that infects tobacco and other members of the potato-tomato-nightshade family. They inserted the synthetic gene into laboratory tobacco plants known to be susceptible to PVY infection. Seeds from these transgenic plants produced seedlings that were completely resistant to infection. The historic CSIRO experiment opened the way for molecular geneticists to use RNAi technology to create synthetic resistance genes that can protect any crop plant against any pathogenic virus, or to explore and manipulate the function of genes in plants. The cells of all complex organisms - animals, plants, algae and protozoans like the malaria parasite - are now known to contain tiny 'nanomachines' called RISCs (RNA-induced silencing complexes). As a prelude to replicating in the cells of their hosts, viruses make a double-stranded RNA (dsRNA) copy of their genomes. The host's own genes make single-stranded RNA copies of their own genetic code, which serve as 'recipes' for the assembly of the proteins encoded by the genes. The cell's protein-synthesis machinery cannot process double-stranded viral RNAs; when the cell detects a double-stranded viral RNA, it activates its RISCs, which contain special RNA-cleaving enzymes, to destroy them. The RISCs 'remember' the genetic code of any virus they encounter, and rapidly reactivate should they encounter that virus again. By making a double-stranded RNA copy of a unique segment of genetic code from a known virus, and incorporating it into a synthetic gene, molecular geneticists can now make any crop plant resistant to any known virus - a plant could be protected against several viruses by a single RNAi gene, armed with code sequences from each virus. Dr Waterhouse's research team, and others around the world, have also shown that RISC complexes can also be programmed with short sequences of code, copied from the plant or animal cell's own genes, to suppress the activity of any gene, with extraordinary precision. Knockout of a gene's activity provides clues to its function. Europe's Agrikola research consortium has used a Hellsgate RNAi vector - a plug-and-play molecular cassette developed by CSIRO's Dr Chris Helliwell, to develop more than 20,000 knockout lines of the plant geneticist's 'green rat', Arabidopsis thaliana - one for almost every gene in the Arabidopsis genome. Arabidopsis is a model for the world's crop plants. Knowing the function of every gene will allow crop geneticists to modify crop plants to improve yields, adapt them to challenging environments - including saline or acid soils, or drought, or to develop plants to yield new food or industrial products, including plastics. CSIRO's Dr Allan Green is applying an RNAi package that will selectively silence genes for enzymes involved in fatty acid synthesis in oilseed crops like cotton, linseed/flax and canola. By adding other enzyme genes, Dr Green's team plans to modify today's oilseed crops to produce oils rich in omega-3 fatty acids, which prevent heart disease and have other health-giving properties - among other things, they are important to brain development and function. Currently, omega-3 oils are extracted from marine fish and added to foods; RNAi technology can be used to engineer ultra low saturated oils for the introduction of omega 3 fatty acids and create a sustainable resource to take pressure off wild fish stocks. I BELEAVE IT'S GRATE THAT THERE IS A BLUE ROSE, A ROSE FOR SO LONG HAS BEEN THE SIMBLE OF NOTHING MORE THAN LOVE AND/OR PASSION BUT A BLUE ROSE TO ME IS THE SIMBLE OR SOMETHING GRATER, IT IS THE SIMBLE OF ANOTHER TRUE FEELING. THE FEELING OF EMPTYNESS/LONELYNES OR SADNESS EATHER WAY ALONG WITH THE FACT THAT IT'S A ROSE THE COLOR BLUE SAYS IT ALL AS TO WHAT IT COULD RESEMBLE. SO ALONG WITH EVERYONE ELES'S COMENTS I WILL ALSO ASK WHERE CAN I PURCHASE SUCH A WONDERFUL CREATION!